At NuVet Labs, we love our pets, and we know that you love your pets too. The truth is that no pet foods on the market today contain enough vitamins and minerals to maintain and enhance your pets general health. 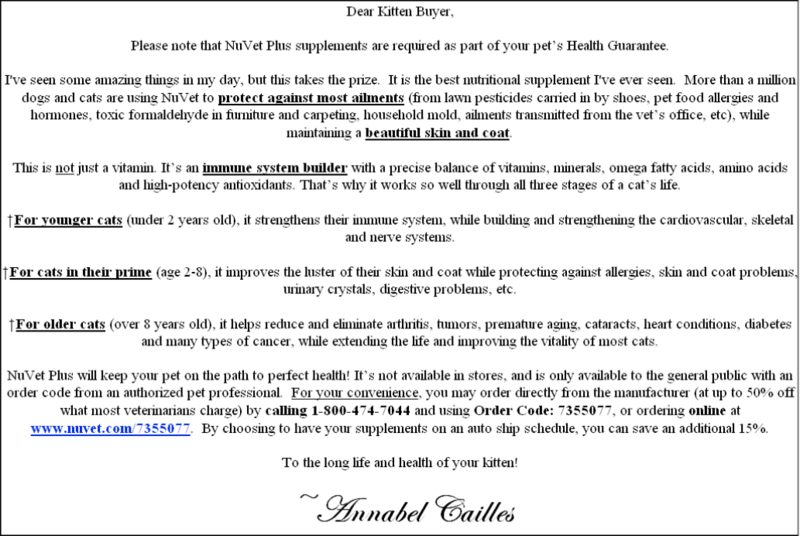 Most of the time important vitamins and minerals are destroyed or significantly reduced during the cooking/mixing pet food manufacturing process. Consequently, most pets lack proper nutrients such as vitamins, minerals, and antioxidants in their diet, even when they are fed top of the line food. NuVet® scientists understood the necessity of filling this dangerous gap. Commercial pet foods often contain harmful “by-products” and useless fillers that can be toxic to pets, causing allergies, shortened life-spans, and serious diseases. This kind of atypical diet creates a scenario whereby their food may actually be creating unstable oxygen molecules known as Free Radicals. These free radicals have been shown to be a cause for a wide range of health problems including heart disease, arthritis, cataracts, premature aging and many different forms of cancer. 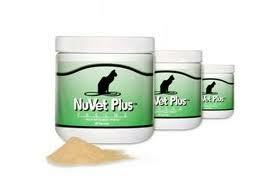 Why Supplement Your Cat's Diet With NuVet? Our pets' wild ancestors ate an "archetypical" diet of living, fresh foods. This wide variety of foods was rich in macro and micro nutrients, including trace minerals, digestive enzymes, phyto-nutrients, antioxidants and vitamins; at least when hunting was good! Today, our companions benefit from some of the same advances in modern food processing as human-kind. Sterilized canned foods and high temperature processing have made our foods much safer and helped eliminate food-borne diseases. Unfortunately for our pets, those scientific advances have also resulted in a modern monotonous diet that is overcooked, over processed, dried, pulped, rendered, injected, formed and pressed. Is it a coincidence that we now see pets with the same modern, diet-based health problems that have developed in our own human population? Diabetes, increased cancer rates, early joint deterioration and allergies are just a few of the modern maladies our pets now share with us. Free radicals are unstable molecules, each of which can damage tens of thousands of living cells. These dangerously reactive molecules cause oxidation (essentially rust) in the tissues of the body. The result is DNA damage, premature aging and eventual death of the cells. Free radicals are everywhere in the same modern world we share with our pets. In the processed foods we eat. In the chemically treated water we drink. In the polluted air we breathe. Free radicals have been implicated in more than 50 diseases including heart disease, cancers, cataracts and premature aging. Today, health-wise people add nutritional supplements and medicinal herbs to their healthy diets, knowing that they need extra protection against the pollution and stress of modern life. Your animal companion deserves the same health protection!